Gordie Howe and the Voyageurs Sparked My Love of History | Where's My Eraser? I really liked school when I was a kid, but in 4th grade, I discovered that history was my first great love. 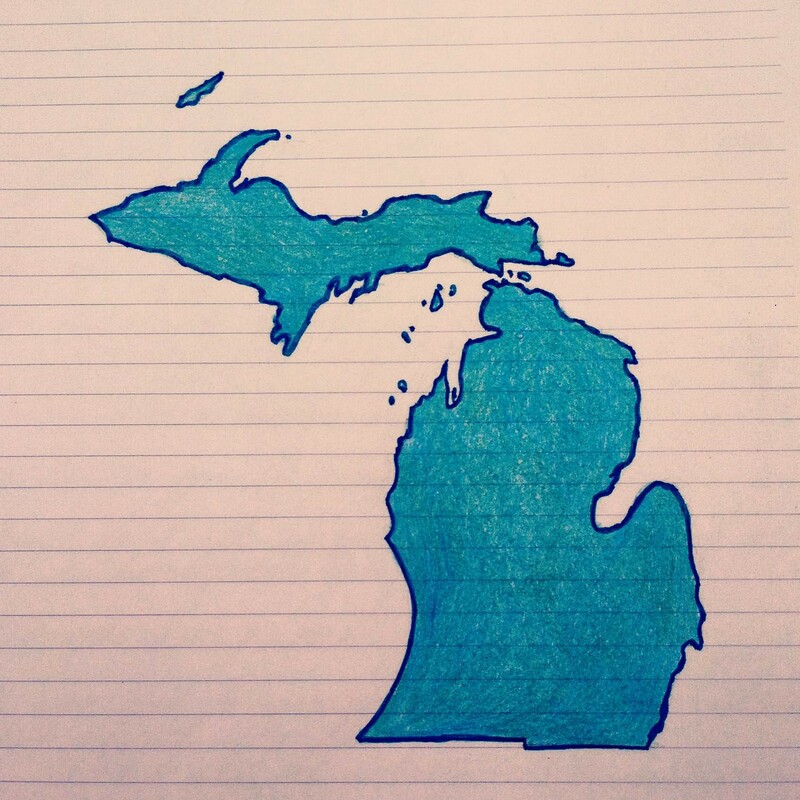 It all started with my Michigan state history class, when I learned that my goofy-shaped home was a pretty great place to live. The textbooks we used—some of the first that I had encountered in my young educational career—had worn-out brown covers and were probably the same books that my sisters had used over a decade before. But I loved them. A brief flip-through at the beginning of the year and my discovery of a picture of Red Wings legend Gordie Howe were enough for me to know that this was the book for me. My dad had successfully brainwashed me into a pint-sized Wings fan, and Gordie was one of his heroes. The guy made goalies look like fools, and there was many a missing tooth around the league because of him. Then there were the voyageurs and the French and Indian War. If you’re not familiar with the voyageurs, from what I can recall from that class, they were French fur trappers in the Northwest Territory of the United States, which is today’s Great Lakes region. They made friends with the Native peoples who lived there, and I distinctly remember learning that they never bathed, believing that the best protection against insects was a hearty layer of one’s own filth. So, the mental picture I’ve always had of the typical fur trapper is a heavily bearded man traipsing around the Great Lakes wilderness whistling “Alouette.” And you can smell him from a mile away. I also recall that during that war, the French and Native people fought against the British and their imperial interests. The Natives were smart enough to hide behind trees and shoot in battle instead of lining up parallel to the other side and saying, “Hey! Let’s shoot at each other!”, as was the European tradition. Nevertheless, the French lost that war, as I’m sure you can guess from the fact that I’m writing this in English and not French. They did end up with French on every Canadian cereal box, though, so there’s that. Then there was Henry Ford, famous for his many industrial innovations and for producing descendants who went on to oversee the time-honored tradition of grossly underperforming Detroit Lions squads. I did a report on him for my class based on one of my mother’s dusty old books. I was fascinated with him. The guy was so savvy that he used every resource he could think of. He made the floorboards of the Model T out of the crates that the engine blocks came in. When his workers complained about their tiresome and monotonous work, he doubled their wages, allowing employees themselves enough disposable income to purchase his cars. His advertising campaigns convinced the public that automobiles were not just for the rich, and sales soared. If the auto industry had a King Arthur, Henry Ford would be it. We certainly learned to look at him as a legend of our state. I’m sure that I could go on and on about him and the other things I learned about Michigan that year. I loved that little class. I soaked up as much as I could. And I’m glad that schools are still teaching it. State history, even if kids don’t realize it, helps build a sense of pride in children about where they’re from. It’s an early step in forming children into proud, informed citizens. It’s also one of the earliest chances for them to begin to understand that the world is a big place and that there’s a lot to learn about it. I hope that kids always have the chance to make the same sorts of sweet little memories that I did. This entry was posted in Elementary Education and tagged 4th grade, edchat, Education, history, Michigan, social studies on June 4, 2014 by Chris Thelen. How cool would it have been to revisit state history later on–maybe late in middle school or something? There’s an awful lot you don’t understand or appreciate in the fourth grade. On an unrelated note, this reminds me of the Michigan play my 4th grade class put on. I was so mad because my only line was in this Michigan alphabet song during which I had to say “W is water, it’s plenty we got”. Is that really even a sentence? That’s hilarious. No, it doesn’t sound like a sentence to me. Not even in Yoda-speak. And yes, it would be great if state history was prioritized in later grades as well. Michigan now has state history as part of its 3rd grade curriculum, so I would think kids digest and retain even less than students did when I was a kid.